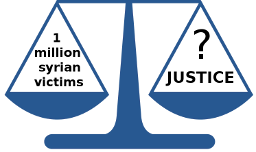 Without an active supporting movement, The Syrian Petition cannot become a success ! At several occasions in the 20the century people waited too long to get out of their comfort zone and oppose openly in word and action injustice. The consequences were terrible (e.g. Ruandan genocide, Srebrenica, Holocaust…). We are again at such a crucial moment of history. If we do not question now the vested economic and political interests that are co-responsible for the genocidal massacre in Syria, our future will be one in which any power can commit such crimes without fear of any consequences. We do not want such a future. Many think they are powerless as an individual, so they could do nothing. This is only partially true. As an individual, you are, in fact, powerless against vested interests, but as part of a movement you are not. So join our movement so that we can stand strongly together to ensure our future and that justice be done. Our movement has the advantage that it is not partisan and not religious affiliated. Our departure point are the laws of humanity as we can find them in the big religions and philosophies, and that found their translation into Criminal Law and International Humanitarian Law. Click here if you want to know more about our organization’s principles. At the heart of our movement are the support committees. Please click on here if you want to register or join a support committee right away. Always try to be at least with two or more. Because communication, the personal contact, speaking and explaining to people, is so important, we think particularly of 3 modes of action (but if you have better ones, don’t hesitate and let us know). That can simply be on a busy square or a busy street (make sure this is allowed in your commune), or at a university, company, school, library (make sure the action is allowed). Try and display the most important texts in size A3. We advise the complete petition, the organization, the crime of omission and our independence declaration : Our proof of independence : we call ALL important responsible leaders by name, no one else does ! This method is advisable, when you are planning to talk to your neighbors. The starting point of a conversation might be the religious orientation of the person, and that we need their help to let a terrible crime not be forgotten and justice be done. That if not so it would put in jeopardy our future and that of our kids. Have a smart-phone or a tablet at hand, where the people can sign right away. If they don’t want to sign right away, foresee small visit card which they can easily put into their wallets, so that they can read through things calmly at home. Just the address http://www.thesyrianpetition.org + the bank details (see below) will suffice. If you don’t have a tablet or smart-phone, just give them the visit card as described above. Ask the person if she is willing to set up a support committee in her mosque/church/synagogue/street/school/university/company/village/town. Ask her to register through our website. We want to be a movement that is carried by many. Therefore, we prefer having many supporters with small contributions, than few supporters with large contributions. Ask the interested person if she/he is willing to support our movement with 1 € / 1 $. At this time, money can only be transferred by bank transfer. Remind the people that we are not government funded, that we are the only ones who call all possible responsible leaders by name, and that we are a capped NGO. We need this money to organize ourselves, to let the movement grow and to take legal action. Put the bank-account number (BIC + IBAN code) on the same visit card. Bear in mind that we are not there to discuss whose responsibility the civil war was. This movement is about a genocidal massacre and the principles of our civilization originating in humanity as enshrined in Islam, Christianity, Judaism and Humanism. Some people will even doubt those proofs. Don’t invest time in them to convince them. People with tunnel-vision will never change their mind, even if the proofs are just in front of them. Please let us know if you have formed a Support Committee or if you want to join one. This will allow us to better coordinate and focus our actions. Click on here to continue.